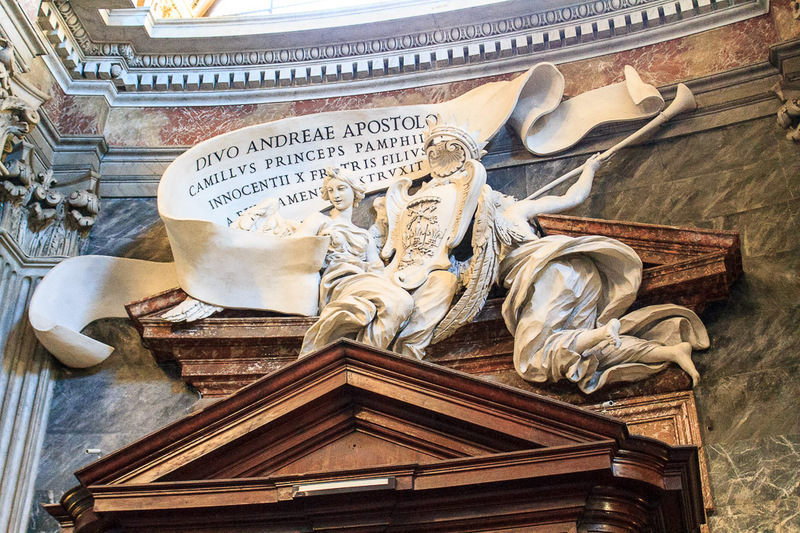 Sant'Andrea al Quirinale is a small Jesuit church designed by Gian Lorenzo Bernini and built from 1658-1670 by, among others, his assistant Antonio Raggi. 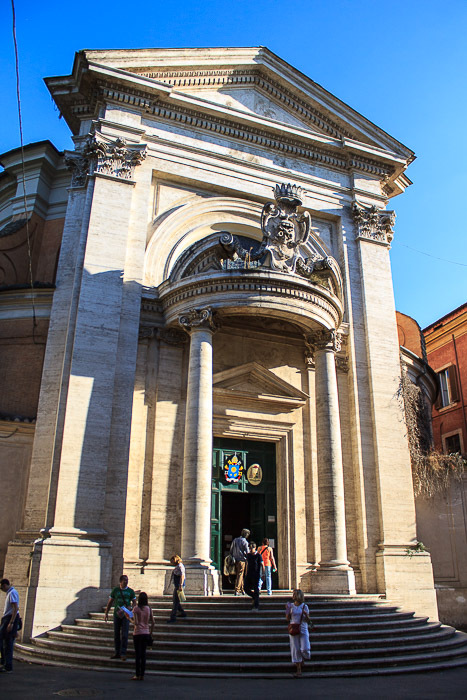 The church is considered one of the finest examples of Roman Baroque, and Bernini considered it to be his only perfect work. The interior of the church is elliptical in shape, with the front door and main altar (1st photo below) being along the long sides of the ellipse, and therefore closer to each other than the two sides of the church. 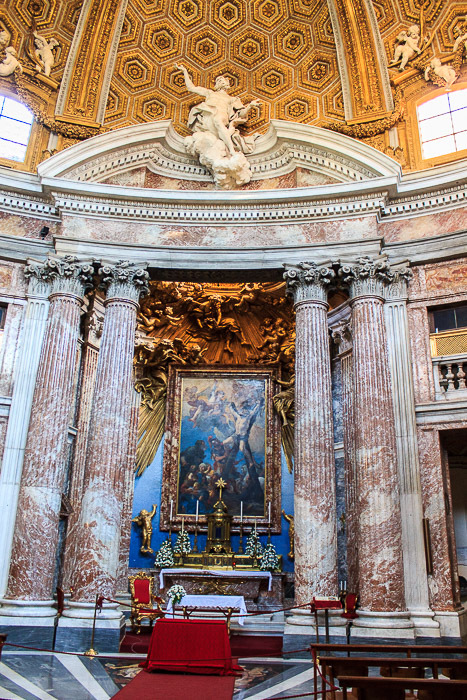 Above the altar is a painting of the 'Martyrdom of St. Andrew', painted in 1668. St. Andrew is the dedicatee of this church. 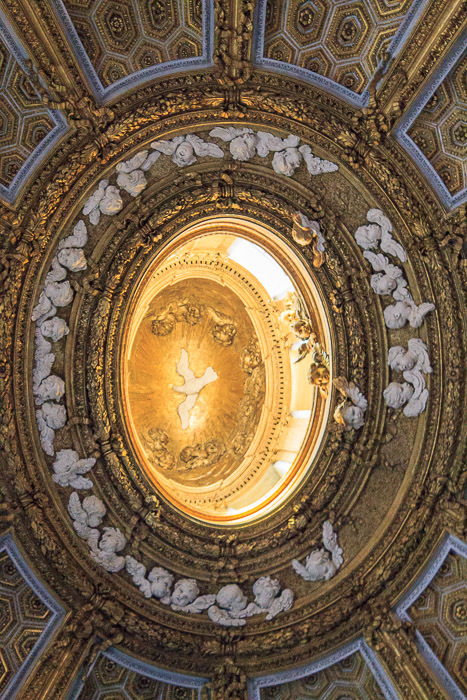 Above that is a Baroque gilded glory, by Antonio Raggi, of angels and rays of light from a concealed window above which sends light down onto the altar (similar to Bernini's theatrical use of a hidden window in 'The Ecstasy of St. Theresa'), which pulls your eyes upward from the altar. Higher still, at the top of the 1st photo below, and shown in the 2nd photo below, is the white stucco statue of 'St. Andrew Ascending to Heaven', also by Antonio Raggi, which is the target Bernini has in mind for your upward-gazing eyes. The saint is shown looking upward, leading your eye still upward to see the dome, which dominates the interior space (3rd photo below). The dome is coffered with progressively smaller hexagons near the top, fooling your eye into exaggerating the height of the dome, and is gilded. 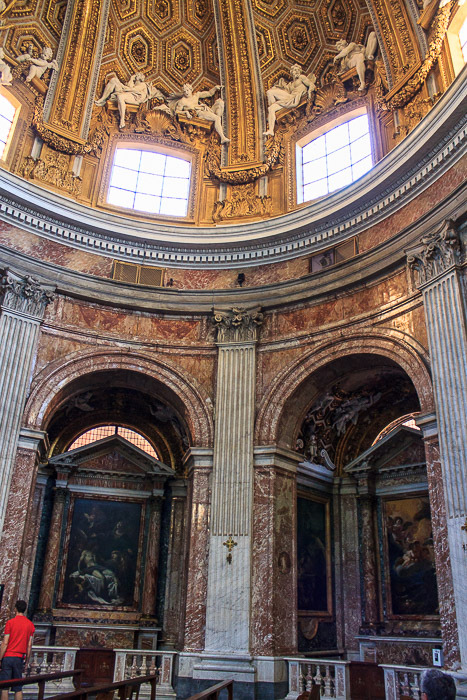 At the center of the dome, pointed to by ten golden rays in the form of palm fronds, is the oculus of the dome (4th photo below), surrounded by putti, with a lantern above it with yellow windows to add more golden light, and with the Dove of the Holy Spirit in the center. Some of the putti have escaped into the oculus, perhaps a joke by Bernini. 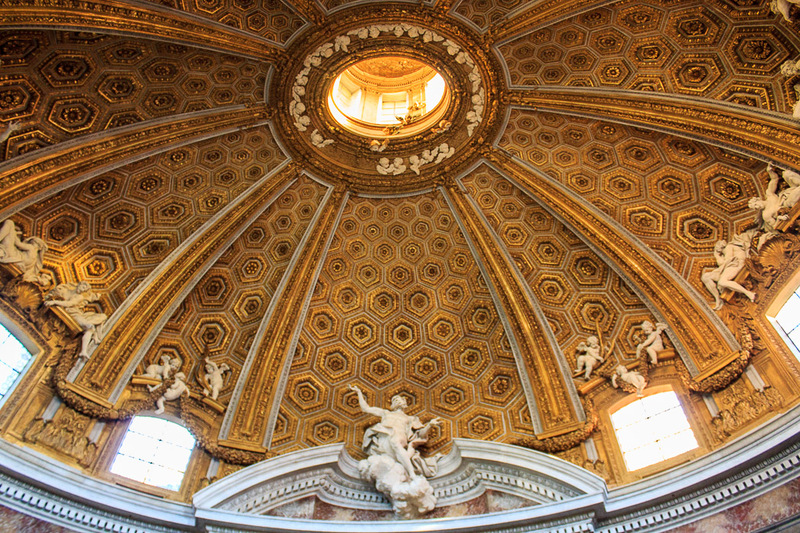 Bernini always adds layer of interest on top of layer on top of layer. 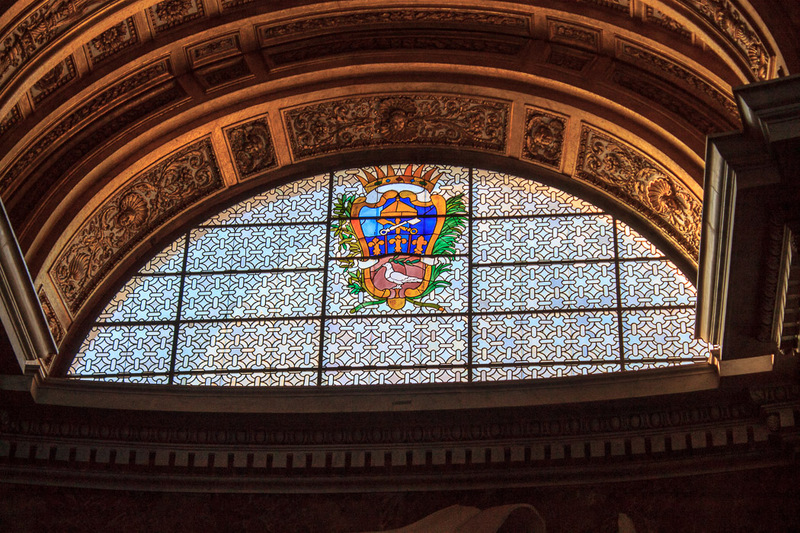 See all Sant'Andrea al Quirinale photos. There are four side-chapels in the church; two are shown in the 1st photo below. 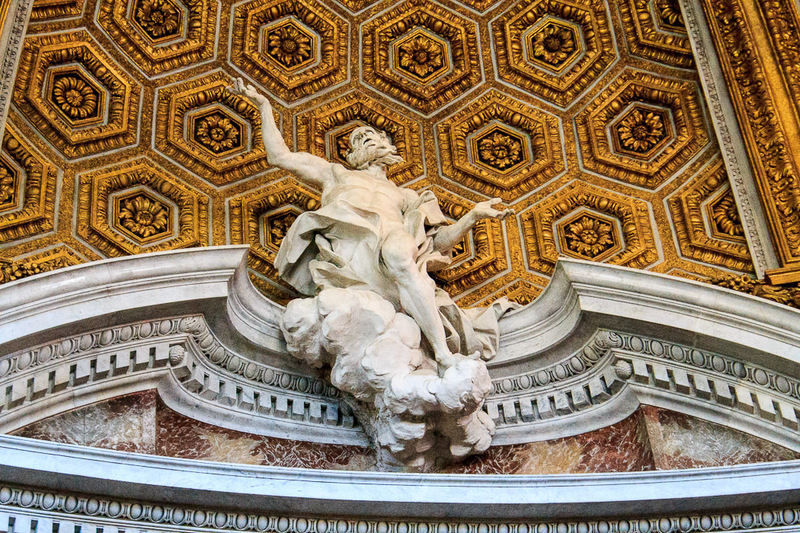 More of Bernini's humor is above the entrance (2nd photo below). The inscription of the church is held by two winged female angels. One is sitting on the triangular pediment above the doorway, holding the sheild of the cardinal; the other is falling off while blowing her trumpet. Above that is the stained glass window in the 3rd photo below, which is also visible in the front facade of the church in the 4th photo below.